Hey Jonathan, I sent these out in an email to a friend who has knowledge of the longear and logperch complexes seeing if he was familiar with these - here's what the big dog told me. really whacked-out megalotis, and you should see some of them further down into Mexico... Cuatro Cienegas megs are crazy! Problem is where do you draw the line? Megs seem to be hypervariable, and even though you get discrete differences by drainage (the downturned opercular flap in the White, for instance), until someone does a rangewide genetic assessment to see where the breaks are, they're going to be treated as just highly plastic." These are pretty much amazing the more I look at em. I so want to see these. What you have there is a sub-species of the L. Megalotis, called the Rio Grande Longear Sunfish. They are found in northern Mexico and southern/SW Texas. 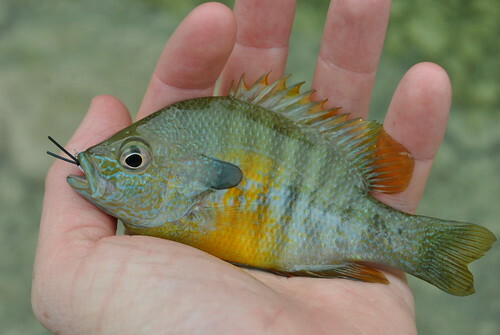 Longears are divided into 6 subspecies that have not been officially named to a subspecies yet, and one that has been officially split into its own unique species (the Northern Sunfish, Lepomis Peltastes).